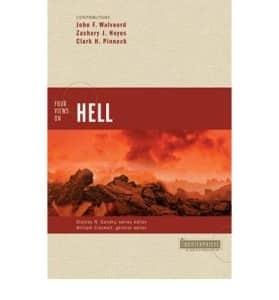 This article summarises and gives the book Four Views of Hell a Review. The book, “Four Views of Hell”, is intended to have the feel of a civilised debate about it. The reader is allowed to see four competing views of hell laid out side by side. Each is presented, then critiqued. John Walvoord argues that Hell is a literal place of literal smoke and flames in which the wicked will experience a very physical form of everlasting conscious torment. William Crockett defends a metaphorical view in which the wicked will experience everlasting torment but that torment is not necessarily one of literal fire. Zachary Hayes is called upon to explain the concept of purgatory. Clark Pinnock defends the view we know as conditional immortality. He argues that ultimately God will annihilate the wicked. The doctrine of hell unfolds slowly, Walvoord says. At times sheol (in the Old Testament) means the grave. Nevertheless sheol, he argues, is at times a place of “fire” (Deut. 32:22) and “pain” (Job 14:22), of punishment and retribution. “In Isaiah, the Babylonians killed in divine judgment are pictured as being greeted in Sheol by those who died earlier” (p17) (Isa. 14:9-10). Verse upon verse is plied to prove that the wrath of God is more than mere physical death. Words such as olam and neash, commonly translated “ever”, are in some contexts limited as to duration in time (e.g. Ex. 27:21), but says Walvoord, “such termination is never once mentioned in either the Old or New Testament as relating to the punishment of the wicked.” (p18). “[T]here is no intimation that this punishment should not be taken literally and continue eternally.” (p18). Walvoord acknowledges that while the Pharisees generally believed in eternal torment for the wicked, the school of Hillel taught that the torment of the wicked would last only one year for all but the most exceptional sinners who would be punished for some time. “Their conclusions are not backed by Scripture”, he says. (p19). Sorry, Hillel! For Walvoord, the teaching of Jesus and his Apostles, even down to the use of the Greek word aionios “forever”, makes explicit what was implicit in the Old Testament. Walvoord admits many Christians struggle to reconcile the notion of a loving God with a real hell. But personal opinion (ancient or modern) is not determinative. Those who believe in the inerrancy of Scripture and in a hermeneutic of literal interpretation must, according to him, accept hell as a place of everlasting conscious torment in a literal fire. Crockett’s view is not intended to be a “modernistic” watering down of Scripture. He sincerely believes (along with a significant minority throughout history) that the Bible’s descriptions of “eternal fire” were intended to be metaphorical. While Crockett agrees with Walvoord that Hell is a place of endless conscious punishment, he says that hell cannot literally be both a place of “blackest darkness” (Jude 13) and “fire” (Mat. 25:41). A literal fire cannot torment spirit beings (Matt. 25:41). He suggests that New Testament descriptions of both heaven and hell are largely symbolic, not a literal description of the furnishings of the world to come. He argues that ancient teachers used hyperbole to underscore a point (Luke 14:26, Mat. 5:29, Luke 9:60). The pictures of hell outside the Bible in Jewish literature are graphic and concrete but were not intended to be taken literally. Crockett believes the authors of the New Testament wrote in much the same vein. Taken as a whole, Crockett suggests, the Bible speaks the language of metaphor to express the otherwise inexpressible horror of the judgment of God. While disagreeing with Walvoord’s literal view he also disagrees with Pinnock’s conditionalist position. The problem of an eternal lack of harmony in the universe, he thinks, is more an argument for universalism. It imposes present-day expectations on ancient writers. He surveys Jewish writers of late antiquity and 2nd-century Christian writings and proves to his own satisfaction that early Christianity affirmed eternal conscious suffering. He rejects the influence of Greek philosophy as an explanation for the abandonment of the annihilationism of Christ and the Apostles by the later generation of Christians. For exegetical support of his rejection of the conditionalist position he relies on the parable of the rich man and Lazarus (Luke 16:19-31), on Mark’s use of the “undying worm” image (Mark 9:47-48) from Isaiah 66:24, and the biblical language about “weeping and gnashing of teeth” (Matt. 13:49-50) and many others. He interacts somewhat, but I believe inadequately with annihilationist views of these key texts. The purgatorial view is based, says Hayes, on the following convictions: that eternal destiny, either heaven or hell, is set irrevocably at the moment of death; that most are not “bad enough” to be consigned to an eternal hell, nor are they good enough for heaven; and that, therefore, some sort of “cleansing” process needs to take place between death and entrance into heaven. Roman Catholic theology adds to this concept the possibility of being aided in the cleansing process by those still alive on earth. In the early church, Origen, Clement of Alexandria, Gregory of Nyssa, and a multitude of others believed the fires of hell were in some sense remedial (Many early Greek theologians actually believed in universal restoration, that everyone would be saved). As for Scriptural justification, 2 Maccabees 12:41-46 (part of the Catholic canon) teaches the possibility of atonement made for the dead that they might be freed from sin. Matthew 12:31-32 speaks of blasphemy against the Holy Spirit as a sin which will not be forgiven, “either in this age or in the age to come.” This at least implies some sins might be forgiven in the age to come, argues Hayes. A third important text, 1 Cor.3:11-15, speaks of the possibility of being saved “as one escaping through the flames”. and only later receiving official recognition and theological elaboration. Few preachers today, says Pinnock, preach eternal conscious torment. They recognize the grotesque moral problem involved in presenting our loving God as a cosmic torturer. Pinnock argues that if we are to take the Bible literally we must take words such as “perish” and “death” literally. To imply that those who reject the “literal” view of hell reject Biblical inerrancy is simply not true. In fact, Pinnock, argues, the uncritical acceptance of the notion of the immortality of the soul, which lies behind traditional interpretations of hell, leads traditionalists to ignore the literal meaning of many Scriptures. Pinnock then provides a good account of those key Scriptures that obviously support the conditionalist view and shows how those Bible verses often used to teach other views are better understood from a conditionalist perspective. Given that a multitude of views concerning hell exists within the Jewish and Christian tradition, Pinnock asks: Must we portray God as a God of infinite cruelty? (No!) Do sins committed in time and space justly merit limitless divine retribution? (No!) Does the so-called traditional view spur believers on in the work of evangelism? (No!) It embarrasses Christians and turns many away from Christ thus harming the cause of evangelism. The metaphorical view does little to lessen the torments of hell, how is it any better than the literal view? The universalist position (not really discussed in this book) takes no account of human freedom. The conditionalist view, Pinnock concludes, may actually save hell (or at least mention of it) from extinction. Many reviewers have commented that John Walvoord was not at his best in presenting the literal view. He does better in critiquing the views of his theological “opponents.” On the whole, while each author presented his own view well, many times the critiques do not deal with the specific texts the other writers presented in support of their case. This makes it a little harder to judge the relative merits of each case. Bear in mind is that this is not a debate about the reality of hell but about the nature of hell. What do the Scriptures say hell is? What is the fate of those who are to be cast into hell? Just to say there is a future judgment in no way settles the matter as to the nature of that judgment. All the authors acknowledge a diversity of opinion among Jewish and early Christian writers on the subject of hell (a diversity that would have been wider had someone sought to defend the doctrine of hell as remedial, leading to the eventual restoration of all souls to God. Universalism was perhaps the prevailing doctrine of the Church – at least in the east – for the first 500 years!). This diversity means it is simply not honest to claim to interpret Scripture against the background of any supposed uniform view of hell in Jesus day, nor to claim any view as correct because “tradition” stands behind it. The idea of taking the Bible literally means different things to different people. No one believes that a literal beast with seven heads and ten horns will literally arise out of the Mediterranean Sea any time soon! Scripture must interpret Scripture, in its literary context, if we are to reach the mind of the Divine author of Scripture. Too many times the obvious meaning of words such as “perish” and “die” are rejected because of an interpretation of John’s apocalyptic vision in the Book of Revelation, for example. I can’t help but agree with Pinnock’s assertion that the uncritical acceptance of the doctrine of the immortality of the soul has to lead many to ignore the obvious meaning of many Scriptures. Thus we do well not to separate the doctrine of hell from other vital doctrines concerning the nature of man and the intermediate state. Has anybody written, “Four Views On Human Nature”, or “Four Views On The Intermediate State”? If you were not a conditionalist this book would probably not make you one. However, anyone reading the book with an open mind, and an open heart, would say that there is a strong case to be made against the “traditional” (I use the term with reservations) view of hell. Considering all the moral problems that the traditional view entails, Why do so many still hold to it so tenaciously. Scripture does not justify such a stand.